Exhaust hoods are the foundation of our reputation for energy savings, and continue to be at the core of most of our installations. We manufacture a wide range of hoods that provide low exhaust flow using the efficiency of natural convection, individual adjustable settings to match the appliances, and the comfort needs of the staff. Our DynaFlow and RevLow hood lines are known for their low air flow and energy efficiency. The DynaFlow exhaust hood reduces energy costs by controlling and minimizing air flow to different kitchen areas, creating a more comfortable environment for kitchen staff. It can deliver fresh air to targetted appliances, while directing it away from cooking and plating areas. Adjustable perimeter discharge in combination with front face air discharge reduces supply and exhaust air requirements, lowering capital and operating costs. Air curtain can be adjusted to specific appliances. Comfort tuning dial allows cooking staff to control how much fresh air is directed at them, improving comfort and productivity. UL listed at 87” above finished floor allowing hood to be installed higher to accommodate tall/custom appliances and to improve aesthetics, leading to better kitchen layout and design. 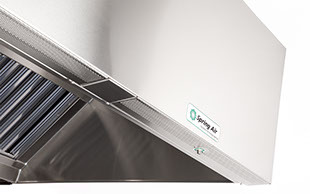 Tri-Zone air delivery system eliminates the need for ceiling diffusers around the exhaust hood. 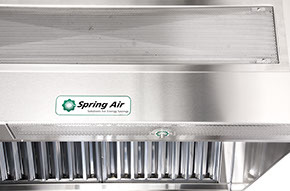 It reduces exhaust and supply air requirements, delivering fresh air to kitchens in a more balanced, comfortable manner. Aerodynamic blade design discharges air stream 11 to 15 feet away from exhaust hood – and away from cooking and plating areas – keeping food at an ideal serving temperature. Dual-zone air delivery system reduces supply and exhaust air requirements with a perimeter air curtain that’s created with fresh air or a built-in blower. Control air flow with a DynaFlow. Energy efficiency and kitchen staff comfort were top priorities for a new urban restaurant. Our RevLow exhaust hood saves you valuable heating and air conditioning dollars by controlling and minimizing exhaust air across individual appliances. A simple adjustment to its baffles allows you to control exhaust flow across your entire hood section. It also gives you the flexibility to add, subtract or replace appliances in the future. Cross-section of RevLow hood interior structure showing patented adjustable baffles.